Yes, our next “Limited Time Magic” surprise is especially for fans of Disney Fairies. 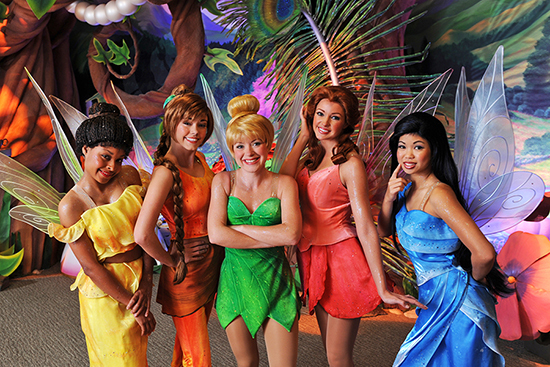 For a limited time, Tinker Bell will be joined by even more of her Disney Fairies friends when they appear at Pixie Hollow in Disneyland park orTinker Bell’s Magical Nook at Magic Kingdom Park. Flying in for the occasion could be Fawn, Iridessa, Rosetta, Silvermist, Vidia or even Terence, the Pixie Dust-keeper himself. It’s all part of “Limited Time Magic” running from April 15-21. Tinker Bell’s Magical Nook at Magic Kingdom Park: 9:15 a.m. – 10:00 p.m. all seven days. Pixie Hollow at Disneyland park: 9 a.m. – 5 p.m. Monday-Thursday, 9 a.m. – 3:15 p.m. Friday and 8 a.m. – 3:15 p.m. Saturday-Sunday. You can also find updates on our latest extra sprinkle of pixie dust on Twitter using hashtag #LimitedTimeMagic and on our LimitedTimeMagic.com web page. This entry was posted in Disneyland, Fairies, Limited Time Magic, News and tagged Disney Fairies Week, Disneyland, Limited Time Magic. Bookmark the permalink.